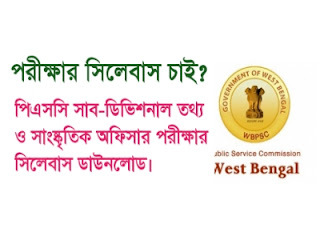 Are you looking for Sub- Divisional Information & Culture Officer Exam Pattern & Syllabus pdf? If yes, here is the right place for you. Recently PSC has released Information & Culture Officer Recruitment Notice. If you are applying for this job, and start practice, so you need to know about Proper Syllabus and Pattern. Today GK Solve Share Sub-Divisional Information & Culture Officer Exam Pattern & Syllabus PDF Download link. You can easily download this Syllabus just one a click. The syllabus is the most important for any kind of Examination. So you must download this PSC Sub-Divisional Information & Culture Officer Exam Pattern & Syllabus.